GoDaddy Email Marketing does offer a custom HTML composer. 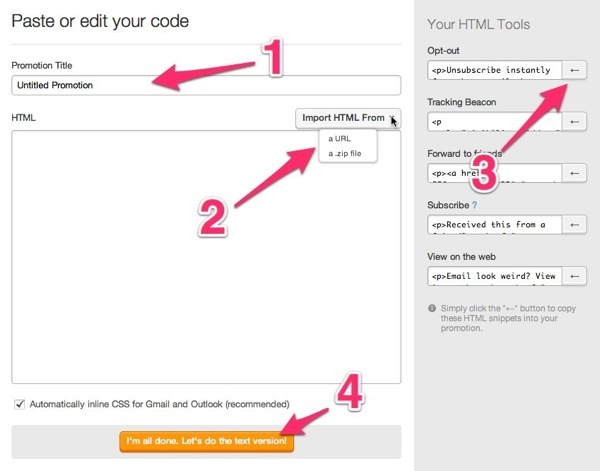 This can be used to create completely customized emails, from scratch, using raw HTML code. The custom HTML composer is completely separate from the standard design composer, and they cannot be used interchangeably. From the Campaigns page, use the little drop down arrow on the Compose button to select Custom HTML. Note: If you haven't created any campaigns in your account, yet, you will not see the Compose button. On the Campaigns page, click the "Create a campaign" button, and then click Save. Now click back to the Campaigns page to find the drop down arrow next to the Compose button. Name your campaign whatever you like. Paste your HTML code right into the editing area, or click on “Import HTML From” to choose to import your code directly from a zip file or a URL. Include any specific code you need by placing your cursor where you want that code to appear, and clicking on the arrow next to the code on the right. In order to insure we’re following all the rules and can easily give you the tracking results you need, GoDaddy Email Marketing requires you to add at least one Opt-out link, and a Tracking Beacon. But feel free to add as many Forward, Subscribe, and “View on the Web” links as you want, too! Note: You must include the "View on the web" code, if you want a thumbnail on the Campaigns page, or a preview image when sharing the campaign. Click on “I’m all done” to save your changes to the HTML and work on the text version of your email. (This is the version people will see if they can’t receive HTML emails). Using custom HTML code instead of GoDaddy Email Marketing's design tools is good for some, not so good for everyone. The thing about designing for email is that there are lots of email reading environments out there and many of them render HTML differently. That being said, here are a few basic things to keep in mind when coding that'll help you with looking okay across the board. Always remember to add opening and closing html tags. Always put your style tags in the head and use body tags. Being that GoDaddy Email Marketing inlines your CSS, you can code normally, so no worries about inlining the CSS while you're working. Use a style tags with "font-family:helvetica" -- rather than font tags.